I’ve been looking for creative ways to serve fresh fruit. Louisiana strawberries ripen in spring and blueberries from my garden will soon be here. Although a fresh fruit cup is fine, combining fresh fruit with pastry is very tempting. 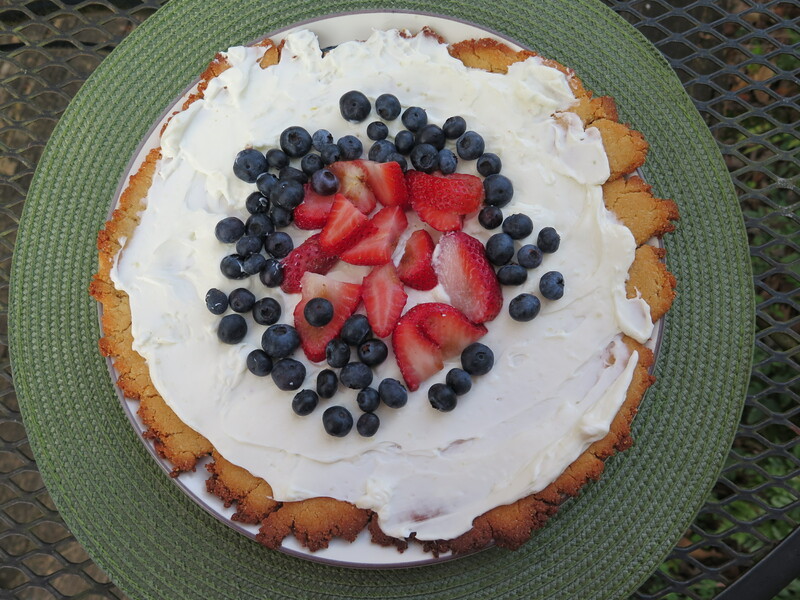 Originally my recipe used cookie dough for the crust and layered on icing and fresh fruit. Yummy, but high in sugar. I have modified it for a more healthy version. Here’s my first trial of making this dessert. 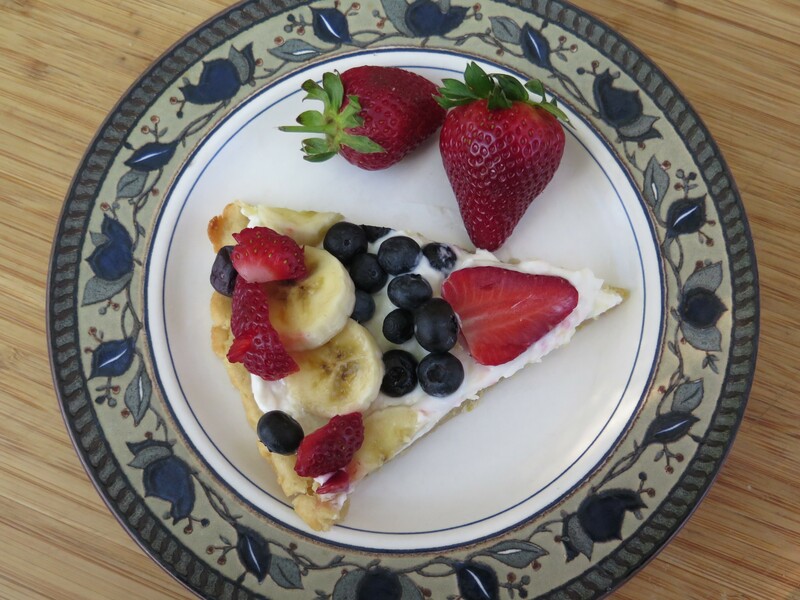 Use your creativity to decide which fruits to place on the pizza. 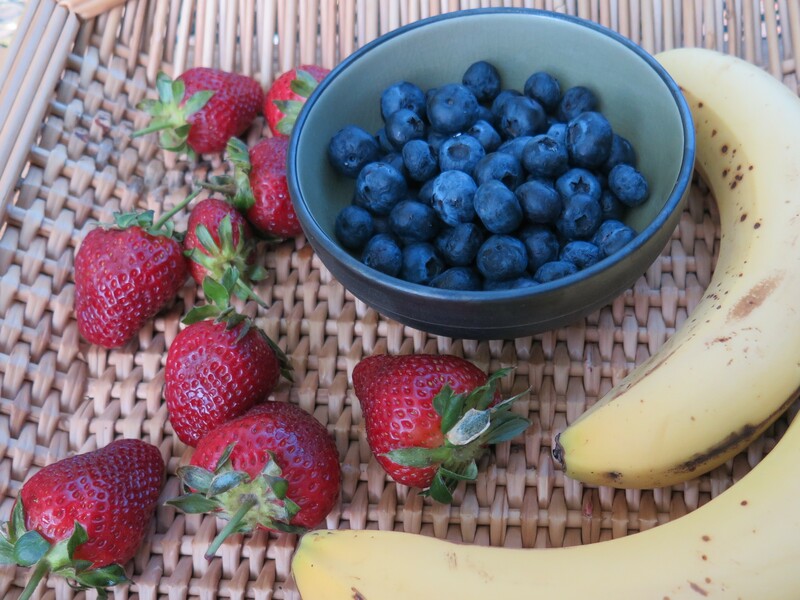 Strawberries, blueberries, bananas, kiwi and mandarin oranges are all readily available choices. This recipe uses a modified pie dough for the crust. It does not contain leavening. I used a combination of almond meal/flour and potato flour in place of all-purpose flour. During Passover the grains of wheat (except matzo), barley, spelt, oats and rye are forbidden. Desserts during Passover are unleavened and may use matzo meal, potato and/or almond flour. In addition, both potato and almond flour are gluten-free (but not matzo meal), so the crust is okay for anyone following a gluten-free diet. To make the crust, blend in the two flours, sugar and lemon zest together in a food processor bowl. Pulse several times to cut in the butter to the size of small peas. Then add 2 Tbsp of the ice water and pulse. Only if needed, add 1 Tbsp additional ice water at a time until the dough pulls away from the sides of the food processor bowl. Gather up and form into a ball. Roll out on parchment paper to a 10″ circle which is about 1/8′ thick. Use a gentle touch with the rolling pin and work quickly. The ice water helps the dough stay cool. Once the dough starts to warm up if will become sticky. Use your fingers to shape the edges, perhaps thicken the edges a bit. Transfer parchment paper with crust to baking sheet and bake in a 375 oven for 15 minutes. Bake until edges begin to brown, it will still be soft in the center. Transfer parchment paper with crust to a cooling rack and cool to room temperature. Then loosen the edges with a spatula and slide off the parchment paper and onto a serving platter. 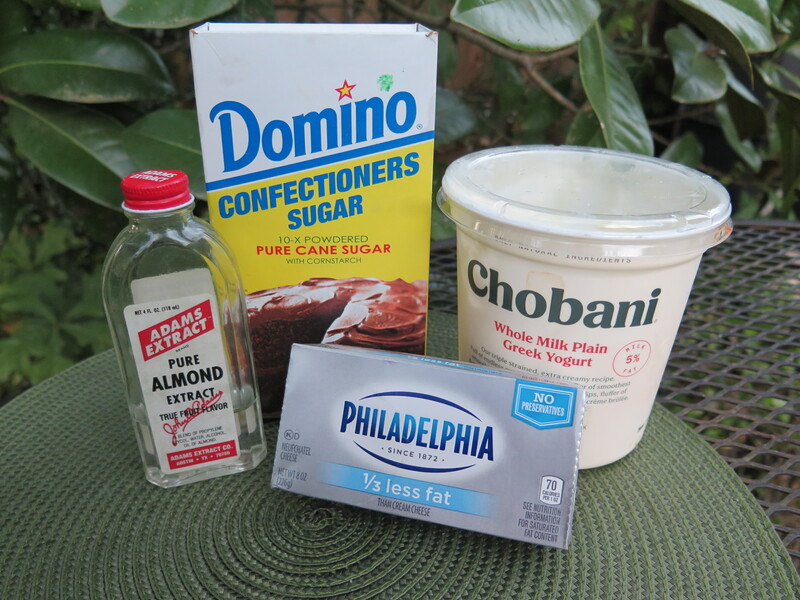 Here are the ingredients for the topping: I used both plain Greek yogurt and reduced-fat cream cheese. 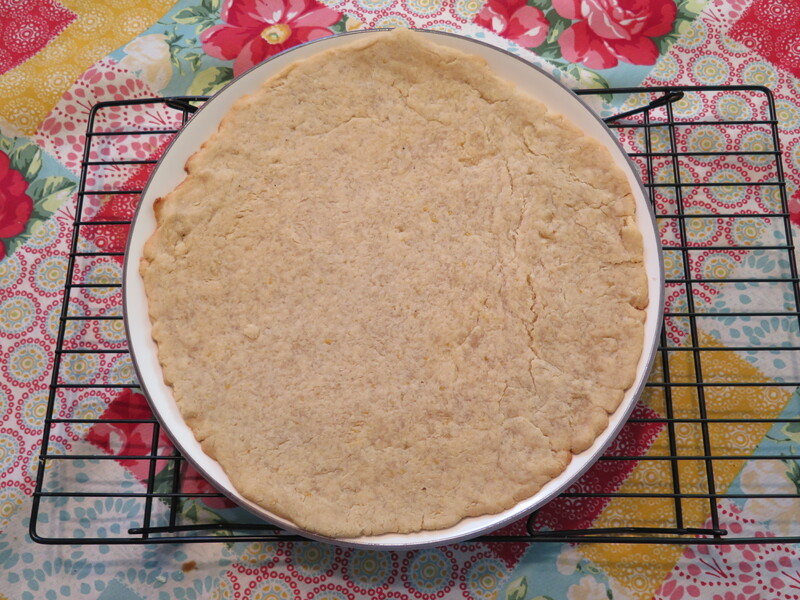 A little almond extract helps accent the almond flour in the crust. Soften the cream cheese (I used 1/2 of this package or 4 oz) and add in plain Greek yogurt, powdered sugar and almond extract. Blend together using a mixer. Spread on cooled crust. Use your imagination in decorating the crust. Slice into 8 wedges and serve. Keep leftovers chilled in refrigerator. 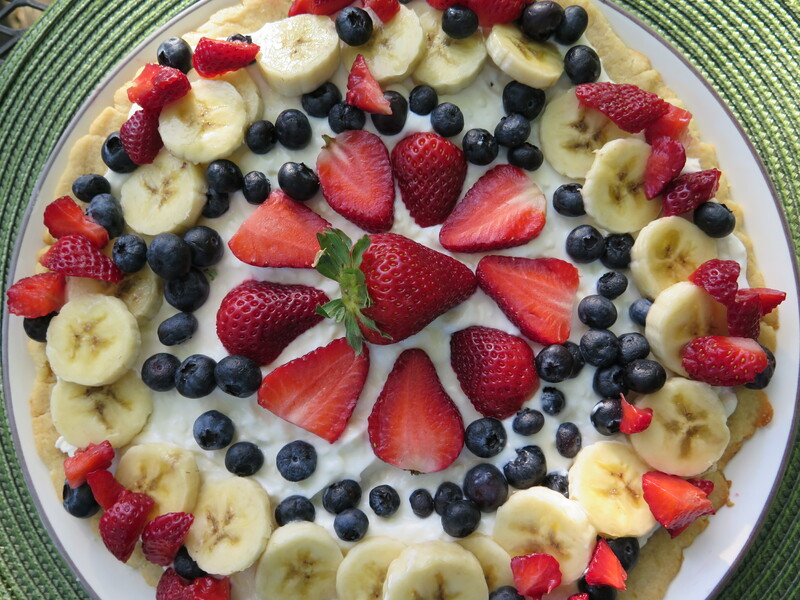 This is a healthy version of the traditional dessert pizzas. it easy to make and great any time of the spring or summer. Enjoy! Preheat oven to degrees 375 degrees. 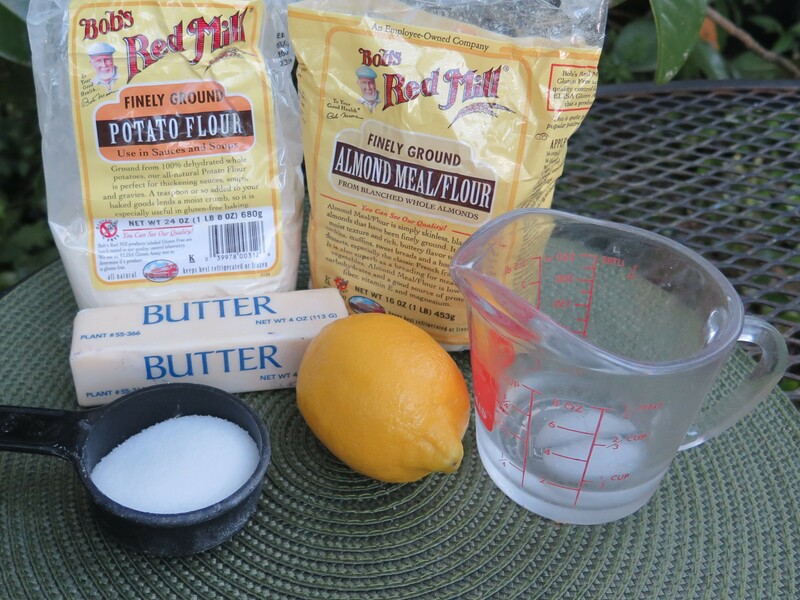 Combine almond meal/flour, potato flour, sugar and lemon zest in medium-sized food processor bowl. Pulse once or twice to combine. Cut butter in chunks, add to bowl. Pulse several times to cut butter into the size of very small peas. With the food processor running, add 2 Tbsp ice water. Process until the dough starts to pull away from the edges and begins to form into a ball, adding remaining ice water, 1 Tbsp at a time, if needed. Place large piece of parchment paper on counter. Shape dough into a ball and place on parchment paper. 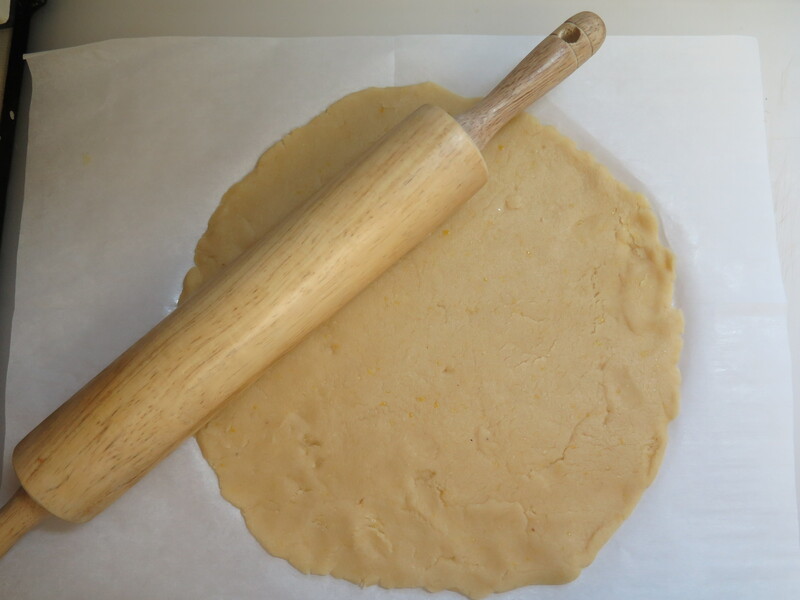 With rolling pin, roll into a 10″ circle, it should be about 1/8″ thick. 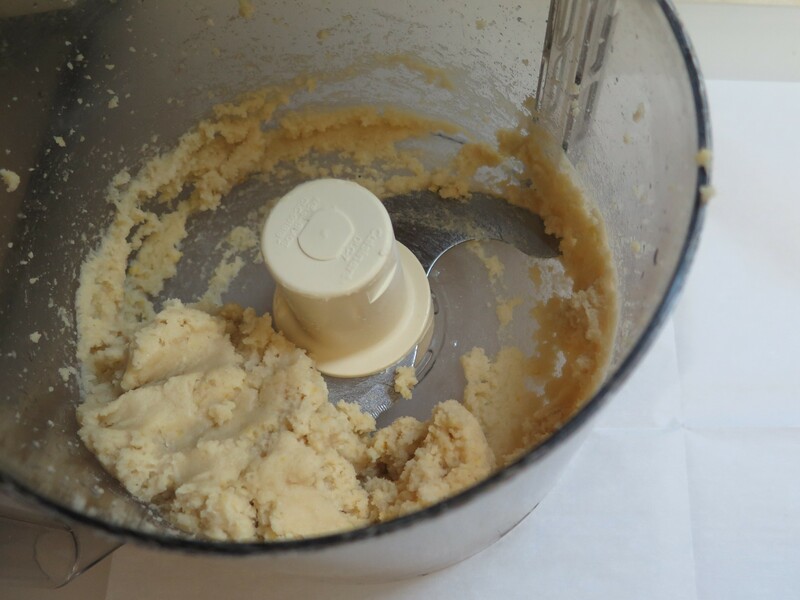 Use a gentle touch with the rolling pin and work quickly before the dough starts to warm up. Use your fingers to shape edges, and thicken the edges a bit. Transfer dough circle with parchment paper to ungreased baking sheet. Bake in 375 degree oven for 15 minutes. Remove from oven and slide parchment paper with crust to wire rack to cool to room temperature. Meanwhile, place softened cream cheese, yogurt, powdered sugar and almond extract in electric food mixer bowl. Mix on high speed until combined and creamy. Scrape sides down. When crust is cool, use a spatula to loosen edges. Slide to serving plate. Spread cream cheese and yogurt mixture on crust almost to the edges. 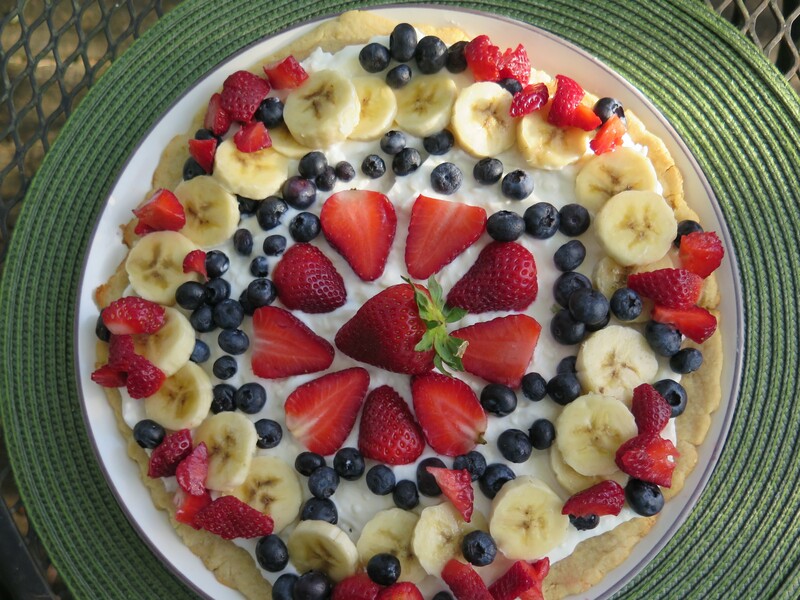 Arrange fresh fruit in decorative pattern on top placing whole strawberry in center. When ready to serve, cut in 8 wedges. Store leftovers in refrigerator. 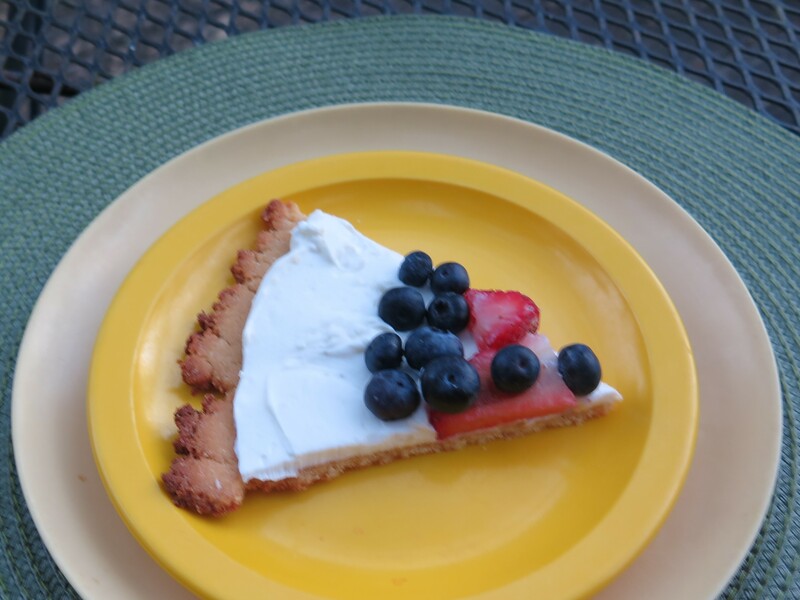 This entry was posted in Louisiana garden, Recipes and tagged fresh fruit, gluten-free, healthy dessert, Louisiana strawberries, Passover by Maylee at Beyond Gumbo. Bookmark the permalink. Thanks! We love it; hope you do, too.